Ahoy Matey! Are you are searching for a healthier snack food that the entire family is sure to enjoy? If so, I am excited to introduce you to Pirate Brands. Pirate’s Booty Aged White Cheddar is a baked rice and corn puff with aged white cheddar that is a favorite with my own children and even my husband and I enjoy eating it too. I appreciate that it is baked and not fried, does not have trans fats and is made with all natural ingredients including real cheese…… a snack that I can feel good about my family eating. These delicious puffs have a satisfying crunch and texture that is also very appealing. Since it is gluten, peanut and nut-tree free it is good for special dietary needs as well. 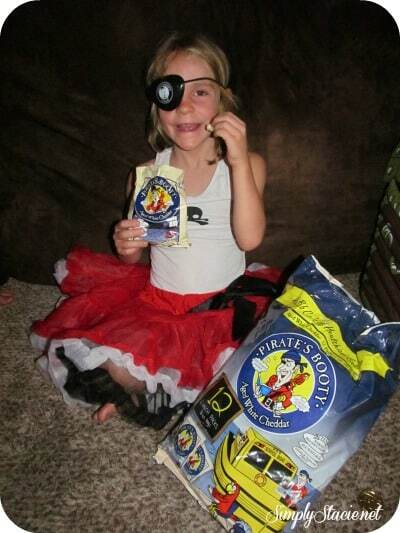 Perfect for lunch boxes and back to school, Pirate Booty is available in convenient individually portioned bags. Each lunch pack has ½ ounces of baked rice and corn puffs with aged white cheddar and amazingly only 65 calories per pack! It has been a big hit in our family’s lunch boxes. 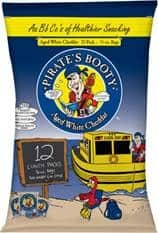 Pirate Booty is available at retailers nationwide (SRP for 12 individual bags is only $6.99) in flavors including Veggie, Barrrrbeque, Chocolate, New York Pizza and Sour Cream & Onion. I can’t wait to try the other snacks in the Pirate Brands line i.e. Smart Puffs, Potato Flyers and Tings. Which one would you love to try? I learned that Pirate’s Booty Veggie is made with spinach powder, broccoli powder, kale powder, carrot powder, cabbage powder and parsley powder. I think I would like to try the Potato Flyers! They are all natural and a healthier alternative to potato chips! I learned its all natural. I *LOVE* the White Cheddar Booty! I learned that Pirates Booty comes in a variety of flavors at only 130-140 cal per serving, I’d love to try the sour cream and onion or the new york pizza! I like that that are Vegan Friendly and Gluten Free. I didn’t realize they had more than one kind! I like the fact that it is all natural. Most of their snacks are all-natural, baked, trans fat and gluten free – pretty cool! Love that they are gluten free! they taste great and I like that they’re trans fat free! They used to have a caramel flavor, it was so good. I don’t know why they got rid of it, it was my favorite. I think I would like to try the chocolate flavor. I would like to try the Smart Puffs. Thanks for the chance to win! I like the Original Tings Crunchy Corn Sticks. Pirate’s Booty is healthier than other chips and snacks! I love that they do not add preservatives or artificial sweetners. The real Wisconsin Cheddar sounds yummy! I think the Smart Puffs sound delicious. I love cheesy snacks! I would love to try the Homestyle Barbeque and I learned that they are gluten free. I’d love to try the aged white cheddar. I learned they have a wide variety of vegan snacks!! Awesome! Pirate’s Booty comes in some interesting flavors….like chocolate and New York pizza. Love that they are all natural and GF! I like that the products are all natural and baked. I learned that they are vegan friendly. What a great healthy snack for everyone!